Just because Monterey County&apos;s average winter temperature is a mild 60 degrees, don&apos;t let that stop you from warming up with a hot beverage! Whether it&apos;s Mexican coffee, hot cocoa or a traditional Irish coffee, the restaurants and cafés below will serve up drinks that will warm you up from the inside out. The Sardine Factory&apos;s bartender, Big Mike, is a Monterey legend. Ask his fans what the perfect cure for winter&apos;s chill is, and they&apos;ll tell you-it&apos;s Big Mike&apos;s Irish coffee. With fresh double cream and a dollop of dark brown sugar, this delectable drink will warm you through and through. 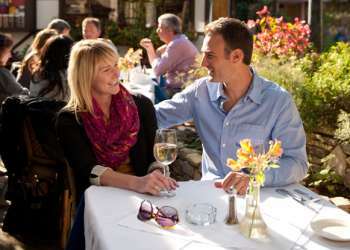 Indulge in luxury at the Inn at Spanish Bay. Sit by the fire pits on the patio to admire the surf, the bagpiper and the sunset, or snuggle inside on overstuffed chairs by the fireplace. Every hot drink is done to perfection, from the traditional Irish coffee to the less traditional Nutty Scotsman to the utterly decadent (and delicious) Chocolate Raspberry Nutty Truffle, a must for every chocolate lover. Once a Carmel Valley hunting lodge, then the Vanderbilt thoroughbred stables, Los Laureles Lodge wears its history proudly. The Los Laureles Lodge Saloon feels like a genuine Old West saloon, but the quality of both food and beverages are a notch above. After a day of hiking or horseback riding, the tasty Irish coffees here hit the spot. A perfect Irish coffee - at a British pub? Believe it. The Crown and Anchor is just a short stroll from Fisherman&apos;s Wharf and Del Monte Beach, making it an ideal stop after a day of kayaking or a December visit to the outdoor ice skating rink at Custom House Plaza, Monterey State Historic Park. Sit on the cozy outdoor patio and people-watch as you sip your drink, or enjoy the authentic nautical flavor of the bar indoors. Though most patrons of A.W. Shucks rave about the Bloody Marys, which pair perfectly with the fresh raw oysters, in-the-know regulars also love the delicious Irish coffees. Enjoy one while you watch the game (football and basketball in winter, baseball in summer). Between one and four PM, enjoy an old-fashioned tea service and the music of Doris Day in the "Day Room" at the Cypress Inn. As you sip any of nine different hot teas, nibble on tea sandwiches, scones, cookies and pastries. In the evening, rub elbows with locals at Terry&apos;s Lounge in the hotel, which claims the best cocktails in town. The fiercely loyal clientele will tell you that the Irish coffees here are tops in Monterey County. Paris Bakery is the perfect spot to visit when both parents and kids need to recharge with a delicious warm beverage (ILLY coffee for the parents, hot cocoa for the kids). Tasty pastries seal the deal. It&apos;s conveniently located just a block from family favorite MY Museum, only three blocks from Del Monte Beach and a short half-mile from Dennis the Menace Park. After a morning kayaking or an afternoon on an Elkhorn Slough boat tour, The Whole Enchilada is the place to warm up. Their specialty, Mexican cuisine from the region of Oaxaca, extends to hot beverages such as the spicy Mexican coffee. The hot beverages don&apos;t end with Irish coffee at Nepenthe. The menu has a legion of coffee drinks, the highlight of which is without a doubt the Keoki Coffee, made with coffee, Kahlua, Créme de Cacao and brandy. It&apos;s perfect for taking the edge off any chill you may get as you sit outdoors, taking in the legendary view of the Big Sur coastline. Warm non-alcoholic beverages are available as well. You can also enjoy your coffee drink indoors by the giant hooded fireplace. Head to the Pacific Grove Golf Links not to tee off but to warm up! The Point Pinos Grill located at visually stunning golf course offers up some steamy concoctions like a variety of lattes, cappuccinos and espressos. If you&apos;re looking for something with a different type of kick try the Tyku Sojo Bloody Mary.